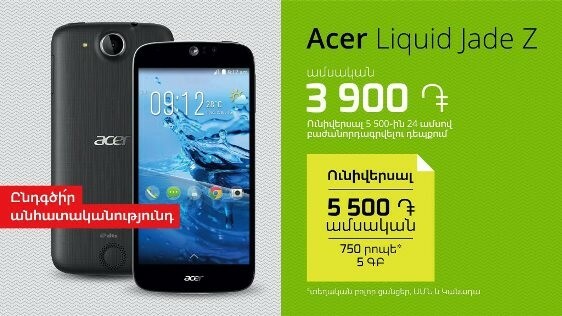 Ucom launched the sales of the popular Acer brand smartphones and tablets. Acer Iconia Talk series tablets and Acer Liquid series smartphones will especially attract those customers who value the elegant design and usability. The built-in camera and high-resolution screen will provide the most vivid and realistic images. New models can be purchased both in the service centers of Ucom and online, with combination of voice or internet offers as the most affordable and appealing option, or by paying the retail price. The smartphones can be purchased starting from 2400 AMD monthly by subscribing, for example, to Universal 2900 tariff plan. While the tablets can be acquired by joining one of the U!Tab or U!Flash mobile internet tariff plans. 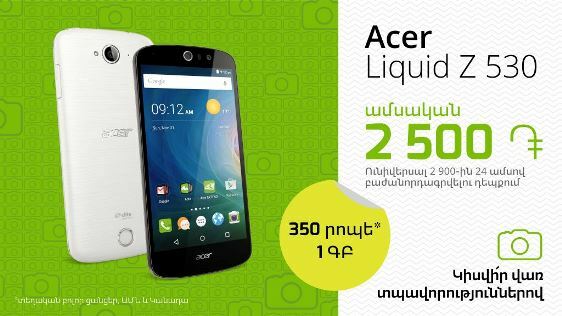 Acer smartphones and tablets are sold with 1-year warranty. “In XXI century it’s impossible to imagine life without a smartphone. If you wish to change your device or buy a new one, surely in our service centers you can find the most suitable option tailored for you. The smartphones and tablets combined with our mobile offers are the best choice for all those, wishing to get a smartphone together with good mobile voice and internet rates”, - said Karen Shaboyan, Director of Sales at Ucom.